All the pregnancy books and birthing classes say that at seven months, the whole having a baby thing becomes more real to dads. Bingo. So I’m sitting in the fully-furnished nursery today (complete with a crib, changing table, dresser, book shelf, and cradle) playing with the brand new car seat (for 5-65 pounds) when I suddenly have the thought, “Holy crap, a real live tiny little person is just a couple of months away from invading my home. We’re having a baby for real!” It’s been cool to imagine having a baby and register for gifts and all, but we’ve got a real baby coming… dang! I’m so not qualified for this position. I’m still working on figuring out how to take care of myself, much less a baby. Of course, the woman realizes the baby is real long before the man. We feel the occassional “kick” which could alway just be gas or an implanted alien. They feel the bundle of joy doing jumping jacks on their bladder. Meanwhile, dad-to-be is able to pretend that his wife has just been hitting Mickey D’s too much and has grown a really huge beer belly. Sooner or later, though -BAM!- it hits you… you’re about to be completely responsible for another human life. Despite this, God put a baby in my wife and in just seven weeks he’ll be here. I’m still learning how to play “Mary Had a Little Lamb” on our new musical octopus! I’m back with some real content, not just goofy videos. I know it’s been a while since my last pre-fatherhood post, but other than a lot of nausea, not a lot happens during the first few months of pregnancy. I could have written endless posts about vomitting, but that just wouldn’t be much fun for anybody. For a non-medically-up-to-date guy like me, new medical equipment seems like something out of Star Trek. Alanna went in for her halfway point ultrasound yesterday morning and we were able to leave with a DVD of the experience. There’s even some 3D pictures and heartbeat sounds! Thanks to a little computer trickiness, I’ve ripped the video and put it online for the world to see. Can a child be embarrassed by their parents prenatally? If so, it’s good practice for later on in life because this baby’s dad is pretty weird. Oh, one important little detail was revealed during this appointment… We’ve got a boy on the way! Pretty exciting! Of course, the first thing mom-to-be wanted do was go shopping for some new blue accessories. We decided to skip all the little outfits with sports equipment on them because if he inherits his parents’ athletic ability, giving him a shirt with a football on it is just setting the poor little guy up for disappointment. Here he is in all his tiny glory! You might notice that he never stays still for even a few seconds. Well, his mom had just finished a healthy breakfast of Corn Pops and chocolate milk, so baby’s on a sugar high. He does kick a lot though, even without stimulants. I think he’s going to be a ninja. Alanna and I were introduced to our baby for the first time today. 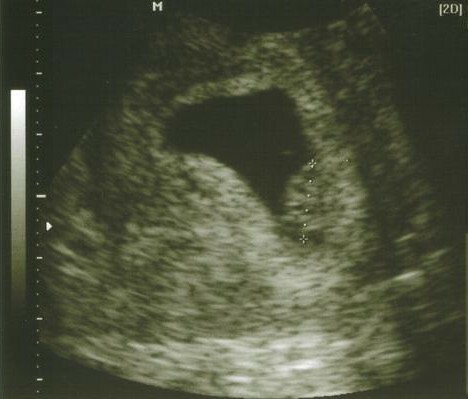 He/she/it is not very active at the moment, but does have a good strong heartbeat (which we actually got to hear). I guess it’s hard to do a whole lot when you’re only the size of a coffee bean… once it gets bigger than that though, I’m going to have to put it to work. We brought home some pictures to share. I think the baby looks like me. The nine months of pregnancy is divided up into three units called “trimesters,” which is Latin for “three mesters.” The first trimester, the place where Alanna is right now, is a lot of fun. And when I say “fun,” I mean, “not fun.” During this phase of Operation Baby, the woman’s body basically goes crazy for a while. You’ve got hormones that have no business being in a human body in the first place suddenly taking over. When these hormones kick in, they usually bring with them a whole bunch of fatigue, soreness, nausea, vomiting, mood swings, and the desire to mix pickles and ice cream. Based on my research, it’s important to note that at this stage, our baby has a tail. It will shrink and go away over the next month, but at this moment, we have a little tadpole. Plus, it looks like there is an alien growing inside of my wife. Watch the skies… and the womb! So anyway, in case you’re wondering (or wandering), Alanna is cool with me making smart alec comments about her pregnancy and discussing her nausea in front of the whole world via the internet. She will undoubtedly hit me, but she would probably do that anyway. (Remember, mood swings are part of the joys of pregnancy!) Stay tuned for more educational moments, most of which is at least somewhat true. Last Wednesday, my wife Alanna surprised me by walking into my office with a bouquet of flowers for my desk. As a guy, I’m not used to getting flowers, but I thought that maybe she was just in a particularly sweet mood and wanted to spruce up the little cave where I spend most of my week. Then she told me to close my eyes and hold out my hands. I obeyed, hoping for candy or maybe pizza. 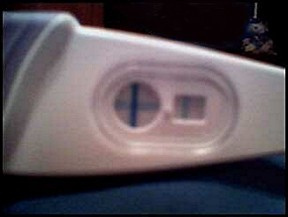 When I opened my eyes again, however, there was a pregnancy test in my hands… and there was a plus sign in the little window. Being a guy and knowing nothing about how these things work, I looked up at Alanna and asked if this meant what I thought it did. She beamed at me. There was my answer. Wow, my head was spinning and a stupid-looking grin spread across my face. Holy crap, I’m going to be a daddy! And I need to wash my hands…. ew. Dan Haseltine, lead vocalist for Jars of Clay, has written a great article for this month’s issue of Relevant Magazine about the harmful ideas our culture has about relationships and marriage. He looks to the marriage of his grandparents as an example of selfless love and love and lifelong commitment. Unfortunately, I couldn’t find the article online, but it’s got so much good stuff to say, that I’m going to type up most of it. After celebrating his grandparents’ sixtieth anniversary, Haseltine wonders why so many people from older generations stayed the course while younger couples give up, why people have discounted the idea that marriage can last. Christian faith has always been a part of my life for as long as I can remember. Believing that there is a God who created this world we live in feels as natural as breathing. I could no more stop believing in God than I could stop loving my wife. I know that because of Adam’s sin, I’m fundamentally flawed, and that I need to be rescued from myself. I also know that Jesus is God and that he left heaven to come down to earth to rescue me by giving his own life in my place. I know that in trusting him to forgive my sin and turning away from those sins, I have become clean in the eyes of God. I know and believe a lot of things. It’s just been a long time since I’ve really felt anything. I’m in seminary and that does a great job of increasing my understanding on an intellectual level, but there’s just something about a faith based almost entirely on intellect that is wrong. I know I’m supposed to love God with all my mind, but what about the part of loving him with all my heart and soul? Heart love seems deeper and truer than just head love. For the first time in a long time, I’m starting to feel again. For some reason, I’m on the verge of tears now when I start really thinking about God. What I’m starting to feel again is love. I think my eyes are being opened. After several very difficult years with trials and difficulties dragging me deeper and deeper into self pity, I’m starting to feel God’s love again. Not because those situations have changed. The trials are just as bad as ever. I’ve been so wrapped up in myself that it’s been hard to see that Jesus loves me. When you’re a kid it’s easy to believe that Jesus loves you in a real way. As you get older and go through more of life it can start to seem like he loves you out of principle because it’s the right thing to do. People in the church make you feel like love is a conditional thing. You have to act, dress, speak, and vote a certain way to earn the approval of other Christians. I know this is a blanket statement that is wrong in a lot of ways, but it’s how I’ve felt. I’ve based my feelings about Jesus love on the love (or lack of love) I’ve received from the church. When my paycheck from the church hasn’t been enough to stretch across my bills, it’s made me feel like I wasn’t valuable. I’ve felt like a lot of people in the church have seen me as a means to an end. Like as a person I wasn’t that valuable outside of what I could do for the church. These people may love me in a way, but I definitely haven’t felt like those same people really like me. And somewhere in my head, I got the church’s version of love mixed up with Jesus’ love. Like he loves me as much as I deserve to be loved. That’s a pretty depressing thought considering how undeserving I felt. There’s some kind of profound change taking place now though. I’m starting to feel like Jesus is not someone who just loves me in some kind of cosmic God way. If I met him face to face, I feel like Jesus would really be interested in me. He’d want to know my story. He’d ask me about my hopes and dreams and he’d really listen while I rambled about my frustrations. He’d let me get angry and once I calmed down, he would look me in the eye and tell me the truth. He would smile and I would see on face and in his voice that he really liked me. He would rebuke me, too, and he would tell me that I have prejudices against some church people that I need to deal with. He would tell me there are other people out there who need love and that he wants me to love them the same way that he does. I think he would tell me what my gifts are and why I have them, and help me know how to use them. He would point out very clearly how God has taken care of me through all these years, all the things he’s protected me from and all plans he has for me. I want to know Jesus the way that Bill Bright did. When an interviewer asked him about Jesus, Bill Bright just broke down and cried right there at his desk. I want to love Jesus like that. I want my heart to break when I think about how unconditionally he accepts me as I am and at the same time wants me to become more like him so I can love other people the same way. I repent of letting other people define my self worth. God is getting into my heart and showing me how to love by showing me how loved I really am. Real love is something beautiful and magical, but it’s hard to put into words. I think I’ve been trying to hard to understand, without letting myself feel. There are parts of the Christian life that I don’t think you’re supposed to understand. You just have to know and believe. I’m feeling very convicted about what a fake I am a lot of the time. I want to be an authentic person. I believe the church needs more authentic people. By that, I don’t mean people who genuinely change who they are to match their talk, but people who are simply honest about who they are. I believe God made me exactly the way he wants me to be, and to be dishonest about who I am is just another way of saying that I know how to do things better than God. So from here on, I’m shooting to be real and I think the first step of that process is to get a lot of the fake crap out in the open. Most of the time, I act like I am absolutely the most important person who ever lived. I think I’m cooler than everyone else and that my ideas are better than anyone elses. Deep down I’m pretty insecure and I don’t believe any of this, but you wouldn’t know it from the amount of time and energy I spend making myself happy. I’m not a Republican, and I don’t believe they are any more on God’s side than the Democrats. I’m not a Democrat either, but a lot of times I lean more to the left than the right. Jesus wasn’t a political figure, and I doubt he approve of everything either party does. I think a lot of things that politicians do “in the name of God” are really motivated by other agendas and add to the reasons why the world hates Christians. I’m more comfortable hanging around a group of artists and pot smoking hippies than I am around some of the people in the church. Even though I grew up in the church and love it on one level, I feel out of place a lot of times. People in the church have hurt me very deeply. A lot of times when I’m in church, I become really fake, putting on a cheesy smile saying things like “God bless you” and other Christian slogans while I shake hands. I don’t even know what I mean when I say those things. Honestly, I don’t hold a grudge against the church, I just realize I’m different than a lot the other people there and don’t feel like I fit in very well. I struggle with lust. A lot. I dress the way I do because I think that makes me look cool. I wear a cross around my neck as more of a fashion statement and a way to make people think I’m spiritual. Overall, I’m very concerned with my image, how I look, how I talk, how I walk. I’m very afraid people will stop thinking I’m cool. I don’t share my faith outside of the church very often. The way I’ve been taught to share my faith makes me feel like I’m pushing Jesus like a vacuum cleaner salesman. Also, I’m afraid that if I tell people what I believe about Jesus they’ll think I’m stupid. When I get angry, I tend to say cusswords. I have doubts at times, not about whether or not I believe what the Bible says, but more about whether or not I can really do anything about it. I feel totally unqualified to be a leader. I think a lot of Christian leaders should quit pretending to be Moses and just admit that they helped build the cow statue. As a Christian, I’m supposed to be known by my love for others, but there are a lot of times when I don’t feel very loving and don’t act that way. I want to be loved, but loving others is hard. I’m always afraid that the people are going to figure out how phony I am. I’m afraid to be real with most Christians because experience tells me I will either be lectured or rejected. I feel like I have to be godly in order to be accepted. This is by no means everything I want to say. I feel like this could be a good first step though. By being true, I hope that I will allow people to get to know the real me and that they will still love me for who I really am. I don’t feel like God wants to use fakes. I may not have everything together, but I do know I want to be the kind of man that God can really use. Originally posted on my long dead Xanga page. Where are the battles today for men to fight? The truth is, we are already in the midst of it. But, like soldiers hiding in a farmhouse and drinking merrily, we often choose to ignore the tumult around us. The enemy is steadily gaining ground in the church, our homes, and our own lives simply because we refuse to admit that he’s even there. There was a time in my life when I fought a very real battle against Satan and his demonic forces, but over time I had convinced myself that a majority of the attacks are coming from within, that I was a pitiful sinner with no hope of truly fighting. I had defeated myself and thusly handed the battle over to the enemy. Reading this book with the urging of the Holy Spirit has reminded me of who I really am. The church has often used the title “sinners saved by grace” to describe the church. Yet, this very thought is what often cripples those who should be the Lord’s greatest victors. “A sinner saved by grace” is what I was, not what I am. “Therefore if anyone is in Christ, he is a new creature; the old things passed away; behold, new things have come.” (2 Cor 5:17) What I am now is a child of the King! A warrior for the cause of Christ. My struggle is not with myself as much as it is with sin. Though I am still learning about the interpretation of this book, it seems clear that this describes the birth of Christ in a way that is a far cry from the description in “Silent Night.” Christ’s birth was a battle, with Satan and all his armies on the attack. We must never forget that we are in a battle. If there is no battle, why are we given armor (Eph 6:11), and why would we be called “more than conquerors” (Rom 8:37) if we are not fighting? Do not let Satan convince you that he is a minor threat, or that he is not concerned with you. Do be persuaded to think that the struggle is with our own human natures. That nature is dead. The struggle is with the evil forces at work in this world. The struggle is with the one who “prowls around like a roaring lion looking for someone to devour.” (1 Pet 5:8) Be a warrior. Be who God has called you to be. Be dangerous to the devil. A warrior for God who knows he’s a warrior can do some damage.